For over 45 years, legends have been made and legacies have been forged. 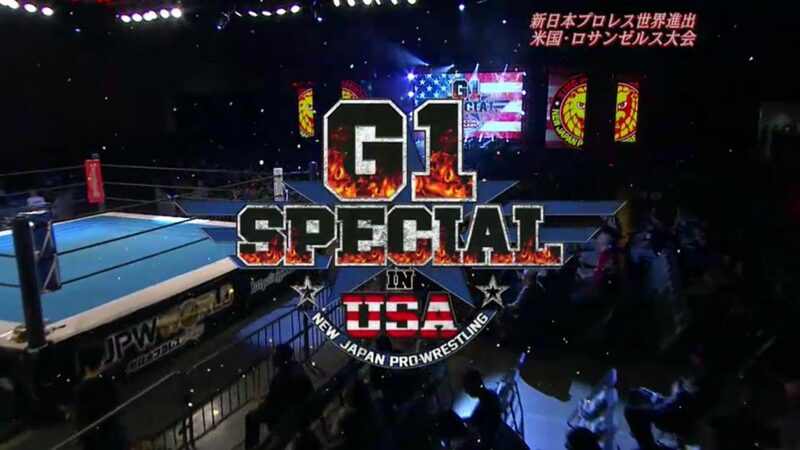 All of that history has led to right now, the G1 Specials in the USA. Tonight, titles will be fought for including the first part of the tournament to crown the first ever IWGP United States Champ. A new era has begun. Jim Ross and Josh Barnett introduce the show and briefly discuss the tournament and the IWGP Heavyweight Title match between Kazuchika Okada and Cody. They also talk over the ring announcers as they list tonight’s matches. This was a fun, extremely fast-paced match. It broke down almost immediately and everyone started fighting everywhere. As JR pointed out on commentary, this is the kind of match where you just have to survive the chaos and hope that you can get one big move to finish the match before anyone else. Very good match. This was also fast-paced like the opening match, but this one had more of a linear continuity to it. It wasn’t as chaotic, so you could follow the action a little more and appreciate everything that was happening rather than be overwhelmed by constant action. Los Ingobernables, as usual, felt like they were in complete control most of the time, but the Liger-led CMLL team had some great moments of their own. Naoki Sugabayashi, the chairman of NJPW, heads to the ring with the IWGP US Title Belt. This was an intriguing match. Hangman Page has really started to rise in ROH, and Lethal went into this match with some very obvious rib problems. Lethal was significantly slower than usual and seemed very much off his game as far as his usual fluid, quick nature. It made the action a little slow at times, but that worked very well for the story created by the situation. I fully expected Page to win this given some of his recent ROH successes (I’m thinking particularly of his beatdown of Adam Cole) and Lethal’s injury, but they were able to use that expectation to make the match interesting even if the action wasn’t what you would expect from a normal Jay Lethal match. Great match! Sabre had a singular focus in this match: destroy Robinson’s arm. Nearly every move and hold he performed was done with that purpose in mind. Robinson, who is significantly bigger than Sabre, used his strength to survive. He managed to perform some nice counters for some of Sabre’s attacks, but Sabre had some great counters of his own. These two did a great job of building hope for counters from Robinson, taking them away, rebuilding them, then taking them away again, usually all in the same sequence. Great job by both guys. A good match. It got a little iffy at one point between Gunn and Tanahashi with a missed catch from Gunn and a light clothesline from Tanahashi, but other than that this was a fun match. It mostly stayed as a series of one-on-ones, then it broke down to a parade of big moves from everyone before a very brief complete breakdown. I liked KUSHIDA in this one. He mocked Billy Gunn early in the match and showed a lot of personality. 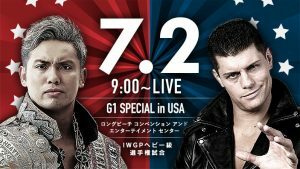 Buildup for the IWGP Heavyweight Title match featuring words from both Cody and Okada. Jim Ross and Josh Barnett discuss the IWGP Tag Title match and the remaining quarter-final matches in the US Title Tournament. They also recap tonight’s show so far. After War Machine and G.O.D. make their ways to the ring, Raymond Rowe gets on the mic. Rowe says that War Machine fought with honor at Dominion, but G.O.D. decided to bring weapons into the match. So Rowe proposes that tonight’s match be no disqualification. Tama Tonga answers by hitting Rowe in the head with the microphone. Good match. The addition of the no DQ rule made for a nice and welcome addition to this feud. It backfired on War Machine at one point when Chase Owens came out to assist G.O.D., but War Machine was able to use the extra freedom to their advantage just as often as Tonga and Roa. The match actually felt kind of quick, but that’s a good thing really. It shows that it was paced well and engaging. I really enjoyed the entire final sequence as well. Very good match. Naito tried to dictate the pace of this match like he usually does, and he succeeded most of the time. But Ishii’s size and power kept him in the fight and allowed him to hit huge moves at the best times. This was a hard-fought battle from both guys and it looked like it really took a lot out of both of them. This was the kind of match where it looked like you could see where the match was going, but a huge move would change the trajectory of the match. That helped keep things interesting. Great match. It built very well to an extremely exciting finish. Elgin had an advantage through much of this match thanks to his size and strength, but Omega doesn’t ever seem to stay down for long. There was a lot of strong style wrestling in this, but also a fair amount of speed and agility from Omega. This is going to be a tough match to top in the tournament. Clips of Cody challenging Okada to a title match after Okada went to a 60-minute draw with Omega at Dominion. Great match. This was very competitive, but Cody (in-character) didn’t seem to take the match as seriously as he should. He did a lot of showboating and got distracted very, very easily. He antagonized Okada with no real sense of a game plan, and it cost him often during the match. Late in the match Omega went to the ring with a towel just like Cody did during Omega’s title match at Dominion. Omega, flanked by the Young Bucks who were trying to get him to stop, tried to get Brandi Rhodes to throw the towel in for Cody. It seemed kind of forced because Cody wasn’t really hurt that bad, but I think that was the point. It was Omega messing with Cody for what he nearly did at Dominion. All of these shenanigans made the last part of the match feel a bit more like sports-entertainment than pro wrestling (for lack of a better description), but I think it was a good way to build interest in a lot of potential stories. That’s not to say the end detracted from the match. It was just a different type of match than, say, Omega and Elgin. This was a great title match with a lot of very engaging parts to it. Okada asks the crowd how they liked the show. They liked it. Okada says he will make it rain strong style all over the world. Kazuchika Okada discusses the show and his match. This was a great show. I think it’s going to be difficult to top tomorrow, but I think some of the stories they set up here could pay off very well. I’m ery much looking forward to the rest of the tournament as well as the Jr. Heavyweight Tag Title match. I feel like the IWGP IC Title match could go either way as far as quality, but I’m intrigued to see that as well. I liked how the show was produced. It really did feel like a NJPW show (with the exception of the crowd, of course). I liked Jim Ross and Josh Barnett on commentary, but I would have liked it if they hadn’t constantly talked over the ring announcers. I found that quite annoying. I enjoy listening to the ring announcers and I feel it’s important. It’s a minor quibble though. I also liked that NJPW apparently kept their rule of no streamers during the show. I like streamers in Japanese wrestling matches, but it always feels weird when US crowds do it. For one, the fans in the United States rarely color-coordinate like the Japanese fans do. It just seems so random. And the US fans can’t seem to throw in unison very well. Of course, part of that is the fact that US ring announcers tend to announce wrestlers on the way to the ring rather than waiting for them to enter so there’s no clear signal to throw. But still. It feels like people are just copying since there’s no tradition for it in America. But yeah. Anyway… those are my feelings on streamers if anyone cares. I think the main event was great too, but I would probably watch Elgin vs Omega again before I’d watch Okada vs Cody. A lot of that simply has to do with preference. I liked the competitive nature of it slightly more than the arrogant approach Cody took. Both matches were probably equally as good though. TAGS: Bad Luck Fale Beretta Billy Gunn Brandi Rhodes Bullet Club Bushi California Chaos Cody David Finlay Dragon Lee EVIL G1 Special in USA Gedo Guerrillas of Destiny Hangman Page Hanson Hiromu Takahashi Hiroshi Tanahashi IWGP Heavyweight Title Match IWGP Tag Team Title Match IWGP US Heavyweight Title Tournament IWGP US Heavyweight Title Tournament Quarter Final Match Jay Briscoe Jay Lethal Jay White Jim Ross Josh Barnett Juice Robinson Jushin Thunder Liger Katsuhiko Kanazawa Kazuchika Okada Kenny Omega Kenta Sato Kota Ibushi KUSHIDA Long Beach CA Long Beach Convention and Entertainment Center Los Ingobernables de Japon Makoto Abe Mark Briscoe Marty Asami Marty Scurll Matt Jackson Michael Elgin Nick Jackson NJPW No DQ Match Raymond Rowe Red Shoes Unno Rocky Romero Roppongi Vice Sanada Shinpei Nogami Sho Tanaka Shunpei Terakawa Tama Tonga Tanga Roa Tempura Boyz Tetsuya Naito The Briscoes Tiger Hattori Titan Tomohiro Ishii Volador Jr. War Machine Will Ospreay Yohei Komatsu Yohei Onishi Yoshi Tatsu Young Bucks Yujiro Takahashi Zack Sabre Jr.